Your esophagus is the tube that carries food from your mouth to your stomach, where digestion takes place. A valve, at the lower esophageal sphincter, normally separates the bottom of your esophagus from your stomach. Gastroesophageal reflux occurs when the lower esophageal sphincter does not close properly and stomach contents containing acid rise up into the esophagus. 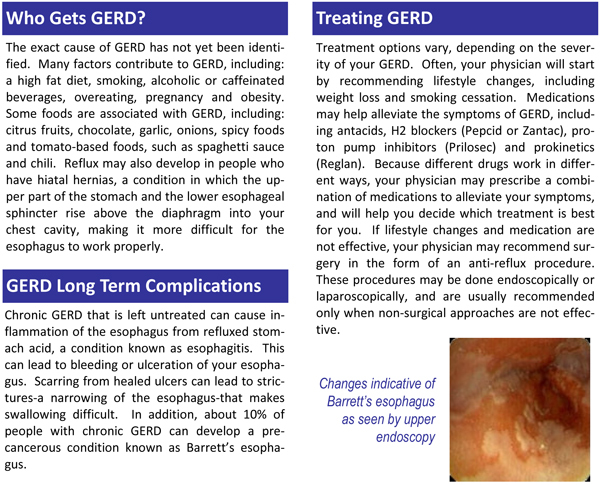 The occurrence of stomach contents in the esophagus is termed “reflux”, and may result in pain and a burning sensation. Esophageal reflux is commonly termed “heartburn” or “acid indigestion”. If not treated, your esophagus, over time, can become inflamed, predisposing you to develop bleeding, ulcers, and even cancer.